Here’s a recent photo from the garden of one of our favorite full sun, summer-flowering perennials, Sinningia ‘Arkansas Bells’. This amazing African violet relative thrives with cactus and agaves in our full sun rock garden, flowering from April until September, during which time, the hummingbirds have to wait their turn. We don’t currently offer this because not enough folks purchased it last time, which drives us a little nuts! 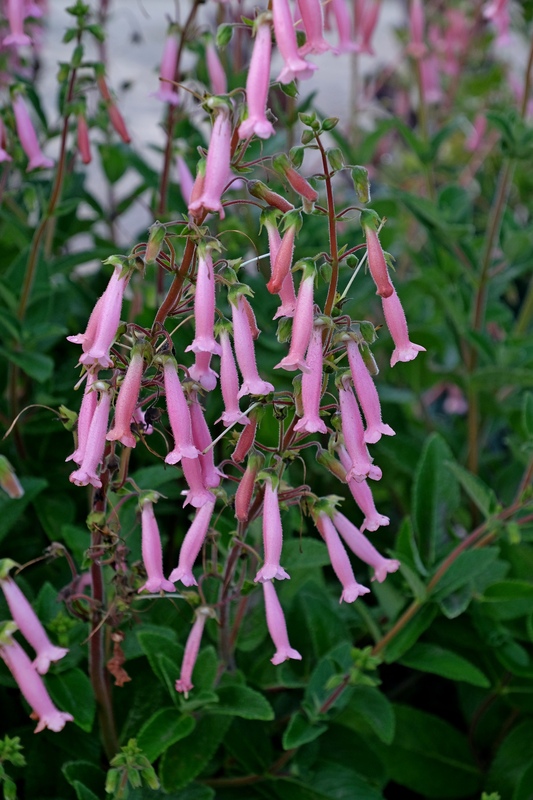 It’s only winter hardy to 5 degrees F in the ground, but makes a superb container plant in colder zones. So, why do more people not buy this? Please convince us to propagate some more since it is so wonderful. This entry was posted in Plant images from the garden and nursery and tagged attract hummingbirds, flowers for hummingbirds, flowers hummingbirds like, flowers that attract hummingbirds, flowers that hummingbirds like, flowers to attract hummingbirds, hummingbird attracting plants, hummingbird flower, hummingbird flowers, hummingbird garden, hummingbird garden plants, hummingbird gardens, hummingbird plant, hummingbird plants, hummingbirds plants, Plants for Containers, plants for hummingbirds, plants hummingbirds like, plants to attract hummingbirds, Sinningia, summer flowers, what flowers attract hummingbirds, what plants attract hummingbirds by Plant Delights Nursery. Bookmark the permalink. You convinced me!!! If it’ll look like that in Texas from April to September, it’s a gotta get item. My original sinningia came from gardeners near Houston, where it was fabulous. I have Sinningia conspicua from your place and love this one as well. However I don’t have full sun for this guy so it’s a no but wish it were a yes. This eighth generation Arkansan covets your Sinningia Arkansas Belle and would be most grateful if you would propagate it again. Please. Pretty please. Ok…that’s two people so far. Would be terrific here in Houston, need this in my yard. Please make it available. You had me at thrives with cactus and agaves in full sun and heat. Must really frustrating when people don’t buy the plants you know they should!!!! Although it must work the other way also???? Yes, some plants are just so good, you just want everyone to grow them! Certainly would buy it if available again. They are wonderful. We purchase one Saturday at the Open House! I’ve been meaning to order some for several years…please propagate more! The two Sinningia ‘Arkansas Bells’ that I bought from you continue to do great in their pots. Very easy plants, plenty of flowers. If they ever die, I’d want to buy more from you. I’d buy it … but I’d try it in more shade where I have been growing plants like S. ‘Bananas Foster’. I wonder if folks are put off by the “African Violet relative” bit (accurate though it may be!) as it raises visions of house plant tenderness, not a plant that’ll take 5 deg in the garden? We’ll add it to the list, but please encourage your gardening friends to give it a try. I just joined a new gardening group and will tell people about Sinningia. Anything labeled ‘Hummingbird plant’ catches attention in my area, as all of us are competing to ‘own’ the most flying jewels!! I’m in Zone 8a. It’s so lovely I’d create a sunny spot for it if I had to. Would the Sinningia still want full sun? I’m guessing I could also grow it indoors, too, right? Yes, it flowers best in 6+ hours of full sun, but also does make a lovely houseplant if you have a bright sunny window. I am currently building a flight for 50 + lorikeets in south Florida. I am looking for plants that provide nectar like grevilleas and others that will grow in my area. Could you make suggestions on plants that are readly available? We have no experience with lorikeets, but below is a link to all of our plants which are attractive to hummingbirds, which should help.